As low as $15.30 for 4 Pairs of Animal EZ Socks + FREE Shipping! $25 Value! Head over to Mamasource to get 4 pairs of animal themed EZ Socks for as low as $15.30 shipped! These EZ Sox Animal Sock Sets make a perfect stocking stuffer. 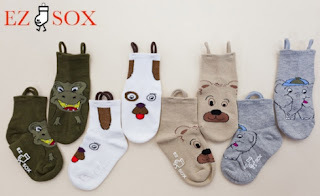 Containing a Dog, Teddy Bear, T-Rex and Elephant socks these adorable sets are sure to thrill. With non-skid bottoms and no seams, these adorable socks are both safe and comfortable. With reinforced finger loops and cute designs these cotton blend socks help kids learn to dress themselves. Choose from two set options, one for little feet sizes 4-6 or one for sizes 7-12. The $25 sets are on sale for $17, but if this is your first Mamasource purchase, use the code DEC10 to make it only $15.30! The deal includes free shipping and you're guaranteed to receive it before Christmas!